Posh manager Grant McCann issues intstructions to star man Marcus Maddison. Manager Grant McCann is determined to ensure Peterborough United peak at the right time this season. In each of the last two campaigns, Posh have been League One promotion challengers at Christmas before fading away badly in the second-half of the season. Steven Taylor walks out for his Posh debut in a friendly at Cheltenham. But McCann is confident that won’t happen again. The club have great faith in the work done with the first-team squad by head of physical performance Ben Mackenzie. 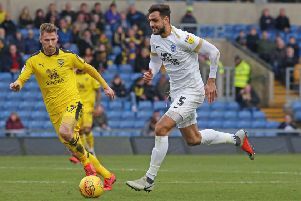 Posh are raring to go in tomorrow’s (August 5) League One opener against newly-promoted Plymouth at the ABAX Stadium, but McCann is more concerned about long-term prosperity. “Of course we want to hit the ground running,” McCann stated. “But I’d much rather have a strong finish than a strong start. “It will be great to get some early momentum, but we’ve faded badly in the last couple of seasons and that’s something we’ve planned against this term. “Sheffield United won League One last season and yet didn’t start particularly well. “We certainly have a tough opener. Plymouth have momentum from last season and they’ve only lost one pre-season game this summer. They have recruited well in the summer and I can’t see them struggling. “They are very well managed. They will be very well organised and they will have the backing of a big away following. “I’m just hoping we get a big turnout from our fans as well. They know how important they are to us and I think they will be well entertained this season. “It’s the first time for a while that we’ve started the season at home so it’s a good chance to show the fans what we are about. Posh have everyone available with the exception of new striker Ricky Miller who starts a six-game suspension for a biting offence while with Dover last season, and injured midfielder Jermaine Anderson who has at least resumed training with the senior players. New 17-year-old striker Idris Kanu will be in the squad as will experienced central defender Steven Taylor. “Taylor looked great in the friendly at Cheltenham last weekend,” McCann added. “He was strong defensively and composed on the ball. Posh have not lost an opening day Football League fixture at London Road since the 2005-06 campaign when Mark Wright’s team lost 1-0 to his old club Chester in a League Two clash. Posh have won their last five opening day home games against Bristol Rovers (4-1, 2006), Rochdale (3-0, 2007), Bristol Rovers (3-0, 2010), Crystal Palace (2-1, 2011) and Swindon (1-0, 2013). Posh have played Rochdale away on the last three opening days, winning twice and losing once.